Lenovo has announced its fourth generation ThinkPad X1 Yoga convertible laptop. The new notebook will come in thinner all-aluminum chassis and will also get lighter than ever when it hits the market several months down the road. In addition, the new ThinkPad X1 Yoga convertibles will be offered with the same display options as the ThinkPad X1 Carbon, which means a 4K Dolby Vision-supporting LCD panel in case of the range-topping SKUs. 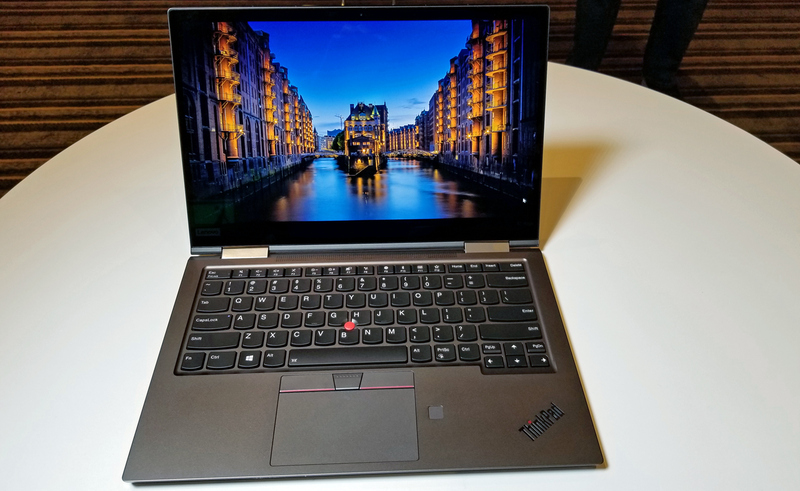 Despite being a part of the ThinkPad X1 product family, Lenovo’s ThinkPad X1 Carbon clamshell and ThinkPad X1 Yoga convertible have always had many differences when it came to design and dimensions. To a large degree this happened because Lenovo wanted to build MILSPEC-graded convertibles and offer some extra graphics performance with its 1st Gen and 2nd Gen ThinkPad X1 Yoga laptops. Last year Lenovo decided to cease using Intel’s processors with Iris Pro Graphics for its ThinkPad X1 Yoga notebooks and thus ended up using the same platform both for clamshell and convertible ThinkPad X1 machines. 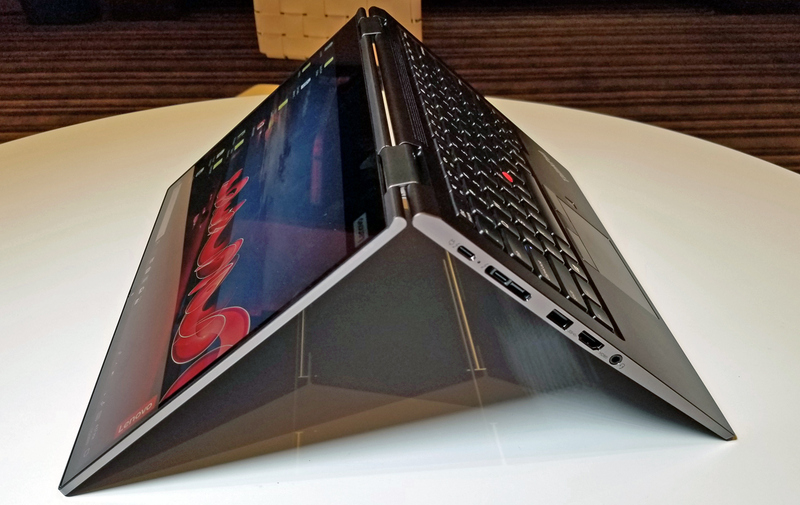 This year the company switches to usage of CNC-machined aluminum chassis for its ThinkPad X1 Yoga, which enables it to make the system considerably more compact and bring it closer to carbon fiber-based ThinkPad X1 Carbon. The 2019 Lenovo ThinkPad X1 Yoga comes in an enclosure that is 15.2 mm thick (down from 17.05 mm) and weighs 1.35 kilograms (2.99 lbs). Because of thinner display bezels, the new convertible 4th Gen ThinkPad X1 Yoga is 17% smaller than its 3rd Gen predecessor, Lenovo says. The chassis are MILSPEC-graded and has passed all the tests that Lenovo puts its ThinkPad X1 laptops through to ensure their maximum durability. The company claims that it was particularly challenging to design an aluminum enclosure this strong and light because aluminum has to be thick to retain its strength. When it comes to internal hardware, the new ThinkPad X1 Yoga will be powered by Intel’s 8th Gen Core i5/i7 processors (think Whiskey Lake) accompanied by 8 or 16 GB of DRAM and a PCIe SSD featuring an up to 2 TB capacity. As for connectivity, the new convertible features Wi-Fi + Bluetooth featuring an improved antenna design, an optional 4G/LTE-A Cat16 modem, two Thunderbolt 3 ports, USB 3.0 Type-A connectors, GbE with a dongle, an HDMI output, a TRRS audio connector, etc. Multimedia capabilities of the new X1 Yoga are also similar to those of X1 Carbon: the convertible has Dolby Atmos-badged speaker system, multiple far-field microphones, and a 720p webcam with or without IR sensors that can be covered using Lenovo's ThinkShutter. Besides, it is important to note that the new X1 Yoga supports all docking solutions, including Lenovo’s ThinkPad Mechanical Dock. Last but not least, display options. The manufacturer will offer its premium 14-inch 10-bit Ultra-HD display panel with a 500 nits brightness and Dolby Vision HDR support with advanced SKUs, other systems will come a Full-HD panel featuring a 400 nits brightness and the ThinkPad Privacy Guard, whereas entry-level models will be equipped with a Full-HD panels featuring a 300 nits brightness. Just like its ThinkPad X1 Carbon brother, the 4th Gen ThinkPad X1 Yoga is half a year away and will hit the market only sometimes in June, 2019. Starting price of the convertible laptop will be $1,929.